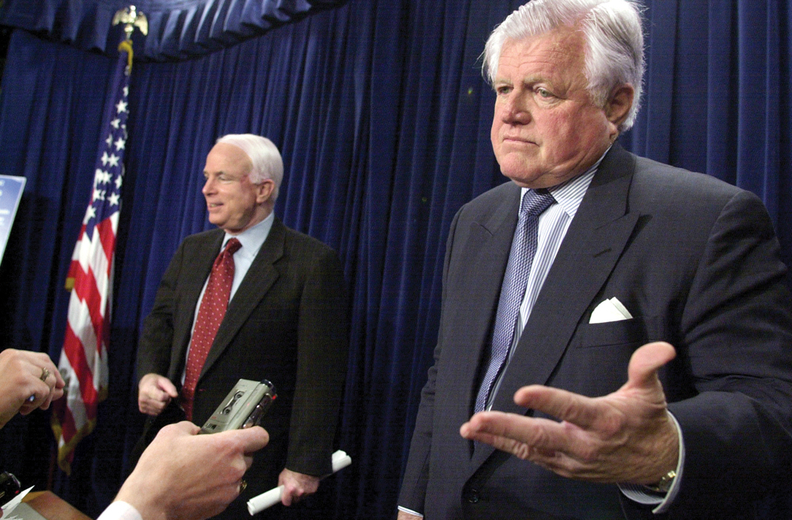 Sen. Ted Kennedy, with co-sponsor Sen. John McCain, answers questions at a news conference unveiling the Bipartisan Patient Protection Act in 2001, which would have allowed families to choose their doctors, independent medical reviews, and the right to take medical disputes to court. Two decades ago, there was a powerful bipartisan movement to set detailed federal standards for private insurance, fueled by a fierce public backlash against then-new managed-care plans that restricted patients' access to care. HMOs and other plans came under fire for practices such as requiring patients to get prior approval from primary-care gatekeepers to see specialists such as OB-GYNs, and rushing women out of the hospital after delivering a baby. Following an advisory commission's recommendations, the Clinton administration, by executive order, established some consumer protections for federal health programs. But the bill-of-rights legislation ultimately died that year, largely due to disagreement over the right to sue to enforce its provisions. RELATED STORY: As consumers' out-of-pocket costs grow, will the patient bill of rights movement rise again?